There are a multitude of reasons for including this version of Kirk in this top five: he has decent attributes, icons, keywords and skills. Oh, and his ability isn't bad either. It lets you return him to hand to prevent and overcome a dilemma he is about to face. 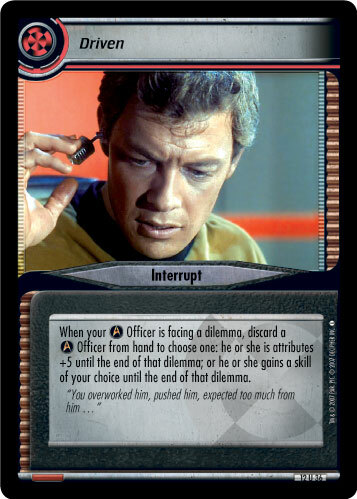 This means that, when this version of Kirk is attempting a mission, your opponent can't just throw down one dilemma to stop you. It gets even more interesting when you have to decide which dilemma to prevent and overcome. Should you go for the first dilemma in the stack? Or, will your opponent anticipate that tactic, and should you go for the second dilemma? Is it worth keeping him back for as long as possible to prevent and overcome the final dilemma? There truly are a lot of possibilities. Kirk's cost of five counters is fairly high, but there are several ways to reduce it if you want to play him over and over again. You could use Energize, or multiple copies of Captain on the Bridge, or exchange him with a cheaper version using Multidimensional Transporter Device. 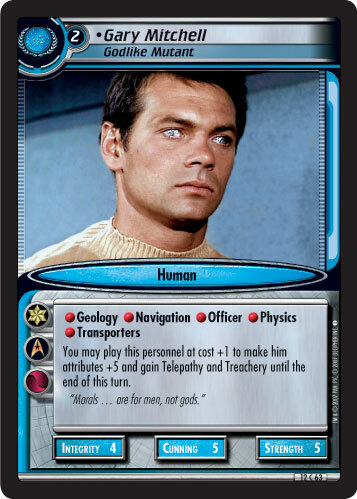 I love to play James T. Kirk (Highly-Decorated Captain) with his upgrade – to download two cards – before exchanging him for Original Thinker with the Multidimensional Transporter Device. After returning him to hand that turn, I can then repeat the process again to download two more cards the following turn. Combolicious! This would be a decent card even without its upgrade ability. Gary Mitchell has the skills to help overcome Where No One Has Gone Before, Breaking the Ice, Captain's Holiday as well as numerous other dilemmas including several damage dilemmas. If you were to use him for mission attempts, the only letdown would be his attributes. Fortunately, for an upgrade cost of just one counter, you can increase his attributes by five until the end of the turn on which he is played. Even then, that's not the end of it, because you can easily return him to hand before playing him again the following turn. This means that he is just one skill away from being able to complete Deliver Supplies, Geological Survey and Investigate Destruction with two (very high attribute) or three (fairly high attribute) friends. The only problem is that he thinks of himself as a God, so would he have any friends? Altovar makes this list for his ability to return Medical personnel to their owner's hands. Specifically, your Medical personnel. Even more specifically, Leonard H. McCoy. Whether you are using Chief Medical Officer to return two of your overcome dilemmas each turn or Fiendish Physician to kill your opponent's personnel each turn, Altovar is the card that makes it all possible. 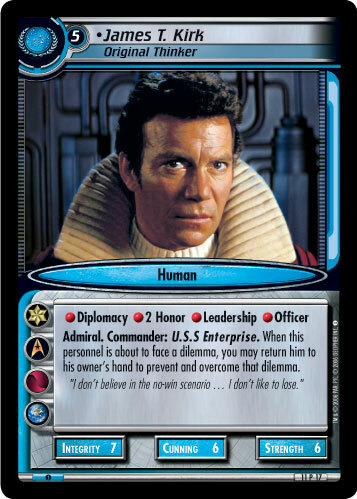 It would take some setting up with Interstellar Treaty, but I have always wanted to base a deck around using three copies of Disadvantage Into Advantage to play McCoy for free each turn. That would be awesome! With the popularity of attribute-based dilemmas such as Excalbian Drama and Fesarius Bluff, being able to increase attributes is a very useful trick. This interrupt is the king of cheaters because it can do just that or it can let your personnel gain a skill of your choice. It only works on Officer personnel who have an Original Series icon, and you need another such personnel in hand to pay the cost, but if there is one skill The Original Series personnel are short on, it is not Officer. A quick search shows that there are 20 such personnel who you could include in your deck. That's enough to have every personnel in your deck have those characteristics. Just be wary of an opponent who likes to play Personal Duty! This personnel, released in virtual form in The Undiscovered Country, can only be described as a weenie. His low cost makes him ideal for a player who just wants to throw personnel at missions until they are complete. 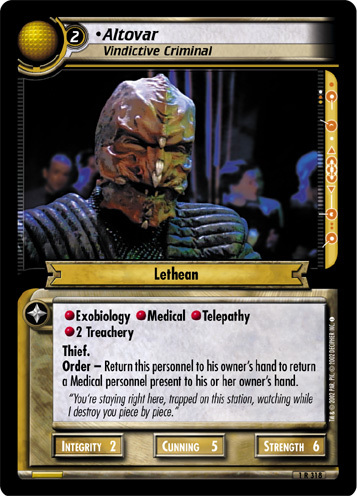 Normally, I despise this type of card, but I'm going to make an exception for Joseph Sisko Lance Cartwright because he is so versatile. 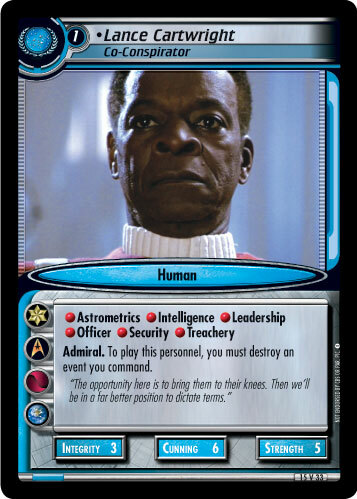 He has the Admiral keyword to help you overcome Dignitaries and Witnesses. He has Intelligence to help you overcome Rogue Borg Ambush. He has the skills required by three missions, and he only needs one skill to help complete a further 16 missions. There are just so many ways that you can make use of him. The catch to playing him is that you must destroy an event you command when you do so. Aside from doing the obvious and destroying a zero-cost event, you could even turn this into an advantage. Lance would allow you to make use of multiple copies of The Genesis Effect, or Debate Over Dinner. If you were to play him to Athos IV, you could even destroy and play another copy of Biogenic Weapon. The Original Series cards typically have an upgrade when they are played, so I think it is only fitting that this top five list gets one as well. (When you begin reading this top five list, you may blink once to make it list +1.) Ironically though, the ship that takes advantage of this upgrade doesn't even have an upgrade itself. It makes the list despite this, because of its ability to reduce the Range required when moving between Earth and another mission. This effectively gives the ship 10 Range as long as you move from one mission to Earth and then somewhere else. 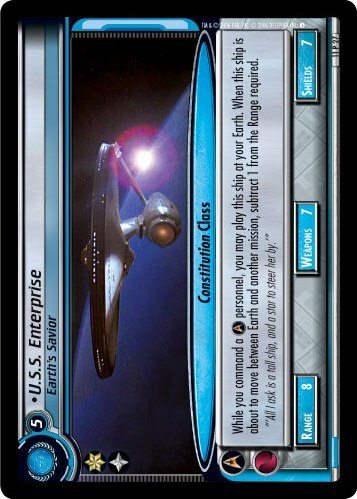 As I discussed in my Starfleet top five article, any ship with more than Range 8 is a huge plus for me. To top it all off, this ship can be played at any version of Earth provided you command an Original Series icon personnel. With the main list complete, there is just enough room to squeeze in a couple of honorable mentions. First up is the I.K.S. Qel'Poh (H.M.S. Bounty), because it gives the Federation access to Kruge (Instinctive Commander). The penultimate mention goes to Spock (Science Officer), because you can use him to look at the top four dilemmas of an opponent's dilemma pile, and the final honorable mention of this series goes to Final Cry. Any card that can prevent your personnel from being killed is good – even if it does cost you three The Original Series icon personnel to save just one. Which cards would you pick in your The Original Series top five? Let us know on the message boards here. Next week, look out for a recap of the 2008 spotlight series top five articles: A top five featuring the best "top five" articles.